08 JulBREXIT What? How Will It Affect Our Markets? After more than four decades of membership, U.K. citizens voted to leave the European Union (EU) by a vote of 52% “to go” vs 48% “to stay.” It was a stunning upset for Prime Minister David Cameron, who wanted to stay, and a major shock to global markets. This could lead to further referendums in the U.K. as Scotland voted 62% to remain in the union along with Northern Ireland. One of the most actively Googled terms in U.K. history occurred the day after the referendum. The question was “What is the EU?” In other words, what did people of the U.K. vote to leave? The advance/decline line has just made another new high on June 30th. This is a very good omen as the major indices usually will follow to a new high. On April 28, 1951, ministers from West Germany, Italy, France, and the three Benelux countries signed the Treaty of Paris. This was the founding document of what was to become, years later, the European Union. The community began with six members, four languages, 177 million people, and $1.6 trillion (in today’s money) in annual output. Today, the EU is comprised of 28 members, 24 languages, 505 million people, and $19 trillion in annual GDP. A later treaty, the Treaty of Rome, created the European Economic Community in 1957. This is the Union that Britain decided to leave. Did the uninformed among BRITS know what they were voting for? Most think not! Was it a vote against the massive migration of immigrants wandering Europe and free movement? Was it a vote against being under the thumb of an increasingly annoying outside governance? Or was it simply the BRITS fierce level of independence coming to the fore? A more important question is “Will it really happen?” In Britain a referendum is not binding on Parliament and Parliament could overturn the decision. Economic consequences are already being felt. Britain’s AAA rating has already been downgraded to AA. The British pound declined to a 31-year low. The U.K. markets lost more money in one day than the country paid into the EU over the past 15 years. These losses affect everyone’s pensions, jobs, salaries and government income and could force Britain into a recession. Yes, we believe there will be many other consequences if the exit really happens. Since ­David Cameron resigned after the vote, a new government must be formed. This new government then must invoke Article 50 of the EU constitution to break away. Yes, there is a constitution. The Treaty of Paris created a supranational form of government in which there is a constitution, a court, a parliament, and executive and presidential branches (actually several presidents), all traced back to that day in 1951. After Great Britain invokes Article 50 (if they ever do) there is a two-year time frame for dissolution of membership. One opinion of the BREXIT comes from one of Britain’s most notable citizens, Sir Richard Branson, who says that “the vote will determine if voters would rather live in Little England or Great Britain.” Another comment comes from two of England’s biggest banks. JPMorgan Chase & Co. and HSBC Holdings plc have said that BREXIT would lead them to move thousands of jobs out of London. And this is only the beginning! You bet there was. World markets tumbled while the Dow Jones Industrial declined 840 points and the S&P 500 was down 6% at the bottom and closed down 5.3% for two days following the BREXIT vote. But to everyone’s surprise the S&P 500 then rallied 5.1% over the following four days putting it, again, a stone’s throw away from a new high at the end of the quarter. With the rebound from the BREXIT vote, the A/D line has just made another new high on June 30th. This could be a very good omen as the major indices usually will follow to a new high. As of the end of the quarter, the S&P 500 shows a gain of 3.84% for the year, which is commendable considering world events. Historically geopolitical events don’t impact the long-term direction of U.S. markets. And our market has been showing great relative strength compared to other major markets since the highs of 2015. Since then, as of mid-June and prior to the rally when the vote was expected to be “to stay,” the S&P 500 was only off from its high of May 21, 2015 by 2.5%. That was newsworthy strength compared to the U.K. FTSE 100 which had declined by 16.2%, the German DAX which was off 22.8% and the Tokyo Nikkei decline of 26.1%. As of the end of the quarter, it has been 397 days since the S&P 500 last hit a record high which was on May 21, 2015. As stated above, the markets were poised to hit a new high just about the time of the BREXIT vote and, also as stated above, the advance/decline line has broken to a new high. Establishing a new high for the S&P 500, which I believe is imminent, is a rare occurrence following a pause of 300 days or more. This has happened only 23 times since 1929 according to Merrill Lynch. The S&P 500 has gained an average of 15.6% during the year following such an extended hiatus and has been higher 91% of the time. Wads of cash on the sidelines could cause an upside explosion if and when a new high is established. According to a recent Bank of America Merrill Lynch survey, money managers are hoarding cash to a level of 5.7%, the highest since 2001. That cash will burn a hole in manager’s pockets if the markets hit new highs. Where Does This Market Stand in the Overall Context of a Secular Bull Market? As you know from these Reports, we believe that a new Secular Bull market was born on March 9, 2009 and continues today. As you also know, Secular Bull markets are usually very long-term events and are punctuated with shorter term declines called Cyclical Bear markets. Ned Davis Research (which is an excellent source) has said that we have been in a Cyclical Bear market since the top of May 21, 2015. That Cyclical Bear market bottomed on February 11, 2016 at 1829.08 on the S&P 500 with a decline of 14.16% and on the DJIA of 14.5%. But wait!! I thought a bear market had to lose 20% to be called a bear market. That is the generally considered designation but Ned Davis uses a combination of market decline and time to determine his Cyclical Bear market designation. And, in fact, a large part of the market did decline by over 20%. The Russell 2000 index of smaller cap stocks peaked on June 23, 2015 and declined by 26.4% to the bottom on February 11, 2016. There was one other short term or Cyclical Bear market during the current long term Secular Bull market. It was from early April into October of 2011with a decline on the DJIA of 16.8%. During that Cyclical correction, the S&P 500 declined 19.6%. Almost the 20% threshold but no cigar. That raises another question. Which index do you use for the 20% bear market threshold?? Looking back over the last three long-term Secular Bulls (see following page [with duration]) and the current one, we see these shorter term Cyclical corrections in the DJIA. I realize that the description of bull and bear market can be confusing but terminology is always useful when trying to place a current trend in its place. 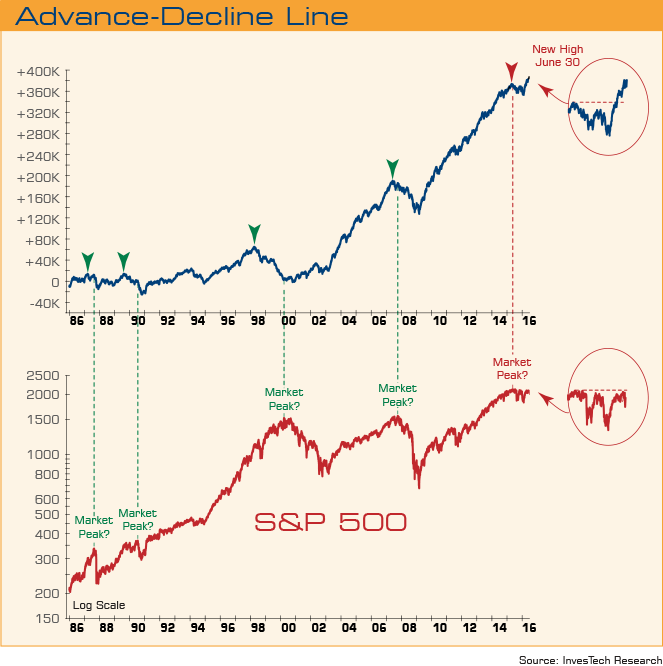 In that vein, the chart here shows the other way we look at market durations and is from Jim Stacks’ InvesTech, also an excellent research publication used here often. This chart actually depicts short term, or Cyclical Bull markets. These bulls were ended when a correction of 20% or more occurred. For instance, the Cyclical Bull market that began in 1982 was ended with Black Monday in October 1987 when the DJIA declined by 36.1%. The next bull move began in late 1987 and was ended with the 21.2% loss in 1990. Then the next one began in 1990 and so on. An important note is that during a long term, Secular Bull market, the corrections, or short term Cyclical Bear markets are relatively mild. Over all three prior Secular Bulls and the current one, which combined lasted 56 years, there were only eight short term, Cyclical declines. And only one, the crash of 1987, at 36.1%, was significant. 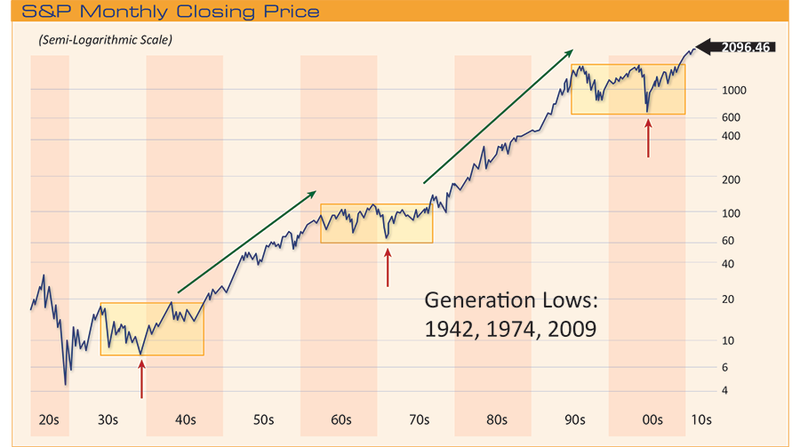 We have had three generational lows since 1929: 1942, 1974 and 2009. I doubt if we will see another over the next many, many years. In our opinion, all this says just one thing to us: the place to put assets is in equities! Bonds have been in a long term Secular Bull market since 1981. While we do not expect interest rates to start zooming up anytime soon, it will eventually happen and a bear market will begin in bonds. Meanwhile, we believe equities will remain in their long term Secular Bull market! Consider the potential of our Large Cap High Dividend portfolio for good dividends and market growth. The current Cyclical Bull market will be ended by a 20% decline someday but in our view there will still be a longer term Secular Bull market which could continue for many years. 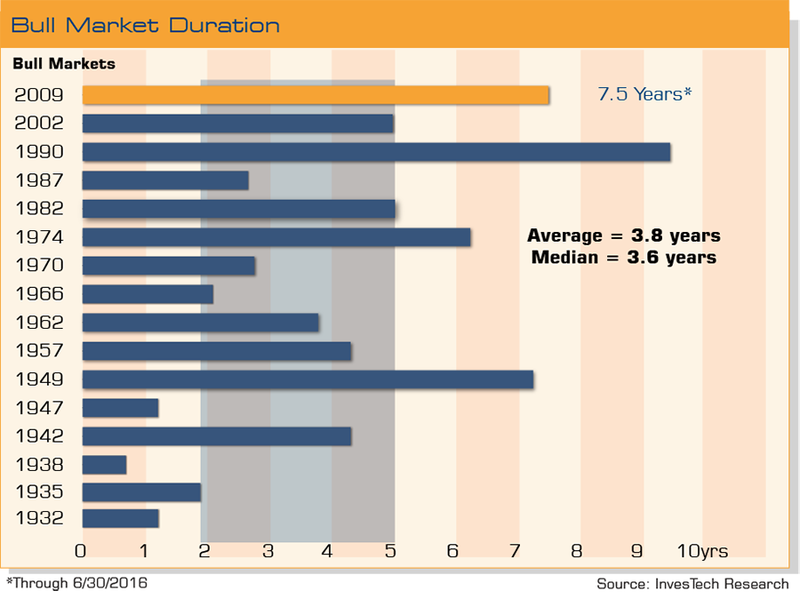 To put all this in context, the chart shows the very long term bull and bear markets and the generational lows that ensued following three Secular Bear markets. It does not show the Secular Bull from 1921 to 1929 but you can see the crash of 1929 on the left side of the chart. It does show the last two big Secular Bull markets as well as the one that began in 2009. The year has been a wild ride so far and the U.S. markets have given a noteworthy account of themselves with the S&P 500 showing a gain of 3.84%. Highlighting the second quarter were the bond markets with government yields, almost around the world, moving to negative interest rates in the attempt to spur growth. In the U.S. the decline in yields, which began in 1981, continued with the 10-year Government bond reaching a yield of 1.45% – just a hair above its all-time low of 1.43% set in 2012. The largest gainers for the quarter were high yield bonds and the 30-year U.S. Treasury bond. Our stand out year-to-date performer is our tactical bond strategy, Fixed Income Total Return, which gained 11.54% (gross) 9.91% (net of max. fees). That strategy was defensively invested in U.S. Treasuries from early December through the correction during February and then allocated to high-yield bonds on February 29 to take advantage of depressed bond prices. Yield to Maturity is 7.02% as of June 30, 2016. On the economic front, the Chicago Purchasing Managers Index posted a gain to 56.8 which is a 13.9 point gain since last December. That is only the ninth time this index has surged 13 points or more since inception in 1967. The message is, if you are waiting for a recession, you might have a very long wait as this is very good news for the economy. 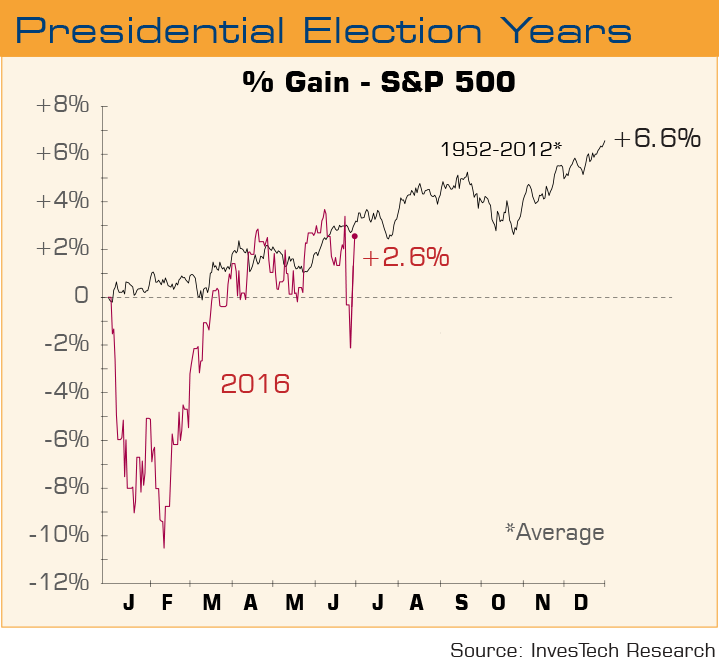 The chart below shows the typical election year pattern for the S&P 500 and where we stand at the moment. Barclays U.S. 7-10 Year Treasury Index measures the performance of U.S. Treasury securities that have a remaining maturity of at least seven years and less than 10 years.